On the (A) bold Princess Royal bound (G) for Newfound(D)land. And (A) eastward and (G) westward right (A) boldly sailed (D) we. When the (A) man at the masthead a (G) sail he did(D) see. 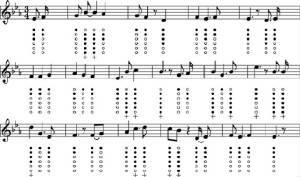 She came right down on us, right (G) onward she (A) bore. And (A) under her (G) mizzen peak, (A) dark colours she (D) wore. "Oh No!" cried the captain, "Now what shall we do? "Here comes a bold pirate and he'll make us heave to." "Oh NO," cried the chief mate, "That shall not be so. For we'll shake out our reefs, boys, and from him we'll go." And when that bold pirate came up along side. With loud speaking trumpet, "Whence come you," he cried. "We come from the free land bound for New Calio." "Then let go your lee braces and heave your ship to. For I have got letters to send there with you." "We will let go our lee braces and heave out ship to. Inside of some safe harbour, not along side of you." Then we let go our reefs boys and they hung to go. We let go our topgallant sails and they did also. He fired one shot after us, in hopes to prevail. But the Bold Princess Royal soon showed him her tail. He chaseded us and he chased-ed us throughout the long day. He chased-ed us and he chased-ed us , but he could not no way. Then he rolled up his mizzen and straight bore away. "Hurray!" cried the captain, "The priate has gone. Go down to your grog boys, go down everyone. Go down to your grog boys, and be of good cheer. For while we have serum, brave boys never fear." The Dubliners are an institunion in Ireland at this stage, and as for Luke Kelly, well a whole industary has has centered around him since his departure. He's regarded as the finest siner of his generation. A bit like what John McCormack was in his time. A good indicator of how popular a singer or band today is, is to see how many hits their songs receive on youtube. Well the Dubliners are by far the most popular group for Irish music on youtube. 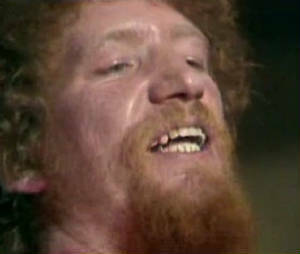 They receive more views that any other group or singer and Luke Kelly songs are one of the most searched of all time. On this site of mine for example two of the most popular songs are by Luke and The Dubs.which are ''Come My Little Son and ''The Night Visiting''.